Sixteen Hampshire police officers and three civilian staff are under investigation over the alleged use of inappropriate and prejudiced language and behaviour. 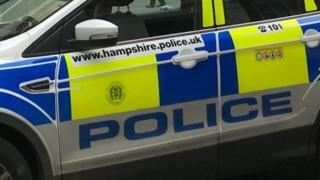 An investigation into a specialist team within Hampshire Constabulary began in February last year, the force said. Five people have been suspended. Of the 14 officers and staff not suspended, 11 have been placed on directed duties while the exact circumstances are established. The force confirmed the investigation centres on a team based at the police investigation centre in Basingstoke. It said it "takes any allegations of this nature very seriously" and had been taking independent advice "from the outset". It added: "We are in the process of conducting a rigorous investigation which is being supervised by the Independent Office for Police Conduct (IOPC)." The force has refused to comment on reports that some of the language was racist and homophobic and picked up by hidden cameras in one of its buildings. The IOPC said it would be "inappropriate to comment further at this stage in the investigation". Hampshire Police Federation said it was supporting and representing a number of officers who have had allegations made against them. It refused to comment further "whilst the investigation progresses". Police and Crime Commissioner Michael Lane also refused to comment on the specifics of the investigation but said he was being "briefed regularly". "If any unacceptable behaviour is identified then this must of course be immediately subject to appropriate investigation," he said. He also said he witnessed "examples of the highest standards" from members of the force "every week". "However, this will never be a reason to accept anything less from the minority who have forgotten or become separated from their responsibilities," he added.